Buy our New Zealand email list to start communicating with businesses in NZ right away. We verify the names, email addresses, phone numbers, and more in all of our B2B email lists so you will have the most reliable information available. New Zealand has an economy that is steadily growing. Now is the time to share your products with influential individuals doing business in this unique country. Get a New Zealand mailing list from us and open the door to communication with business contacts in NZ. At Bookyourdata.com, tailoring an email address list to fit your preferences is not a problem. Use our list-builder option to customize your targeted email list to include contacts who serve a particular job function or hold a specific title. Also, you can choose what sizes of companies you want to connect with as well as what level of revenue they pull in each year. Fashion a list that pinpoints the professionals who can contribute the most to your business success. We also have ready-made business lists such as this one for a more comprehensive approach. 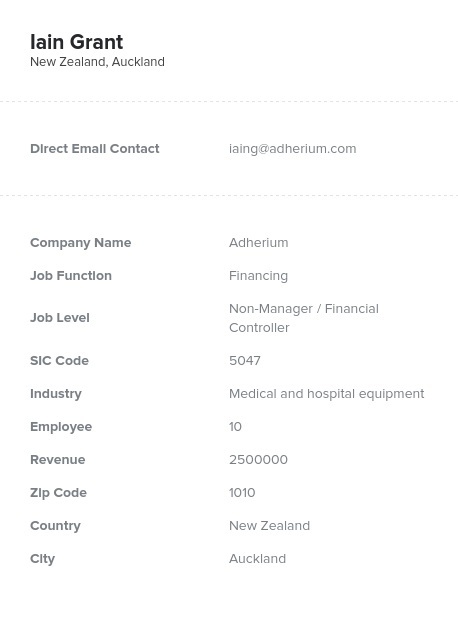 These feature a large selection of contact information that helps to streamline the process of making connections with Kiwis. Taking advantage of business and sales opportunities across the globe has never been easier. Download our New Zealand email database today and reach out to the professionals in New Zealand who can give your business the push it needs to go over the top!